Posted April 17th, 2017 by Mike Boyes & filed under Consciousness, selfies, Social Cognition, Social Perception, Social Psychology, The Self. Description: OK your new dating site profile is almost ready to go, or your new professional network or social network posting is ready to go and all you have to do is add a profile picture. You have 12 pictures of yourself to choose from. Who should pick the one you post you or a total stranger? Well in this age of selfies surely we would be the best judge of which picture of ourselves to post right? Read the article linked below and see what research has to say on this increasing everyday question. 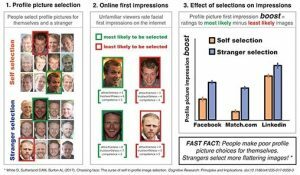 Source: Let a Stranger Pick Your Profile Picture, Janice Wood, PsychCentral. So, let a stranger pick every time! Did you see that result coming? Total strangers pick pictures of us that are rated as more attractive, more professional, more competent, than we pick ourselves. The researchers showed that result very clearly but they were NOT able to say anything about why this result occurs. 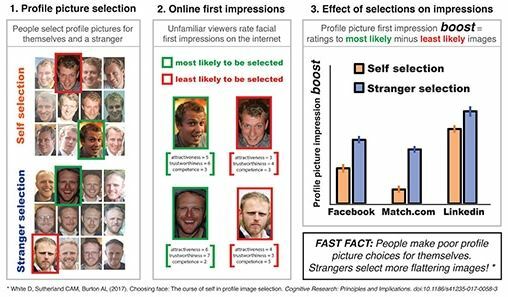 So as future research is needed, think a bit about what sorts of things we should look at as we (well as the searchers) try to figure out why strangers do better than the profile owner in selecting the “best pictures” for the site. What sorts of things go into making a picture of someone look more attractive? More professional,? More competent? When do strangers do better than the profile owners in picking profile pictures? Does this prediction vary depending upon the site involved? What sorts of things might be worth looking at in trying to sort out why strangers pick better profile pictures than we do?